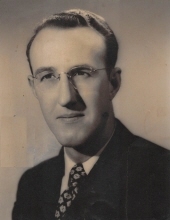 William George Elliott of Plymouth, beloved husband of the late Elizabeth, passed away July 16, 2018 at the age of 95. Bill was born to Joseph and Georgina (nee Urquhart) in Highland Park, Michigan on May 1, 1923. Bill is survived by his two daughters Beverly (Thomas - deceased) Simmonds, and Patricia (Thomas) Welland, his grandsons Eric and Carl Welland, his dear sister Evelyn (Don - deceased) Ritenour, and many nieces and nephews. Bill was preceded in death by his wife Elizabeth (nee Wiseman), and his two brothers John and Thomas Elliott. Bill graduated from Plymouth High School in 1941, and then began his career as an electrician. After serving with the US Air Corps in WW II, he headed to Massachusetts to be near his future wife and earn a degree in Electrical Engineering from Lincoln Technical Institute. Bill continued his education at Northeastern University in Boston, and Wayne State University in Detroit. After he and “Betty” were married in 1949, they moved back to Plymouth, and Bill was employed by Ford Motor Company for 33 years. Bill and Betty were married for 61 years, and lived in their home on Penniman over 50 years. They enjoyed entertaining their family and many friends. Bill and Betty visited all 50 states, and made several trips overseas to visit relatives, see the world, and research genealogy. Bill was a member of the First Presbyterian Church of Plymouth, and the Plymouth Historical Society. He will be missed by all who knew him and loved him. "Email Address" would like to share the life celebration of William G. Elliott. Click on the "link" to go to share a favorite memory or leave a condolence message for the family.